JPMorgan Chase & Co. CEO Jamie Dimon buys 500,000 shares of the bank in the open market. For patient, value-conscious investors, that's a signal worth listening to. U.S. stocks are higher in early afternoon trading on Friday, with the Dow Jones Industrial Average (DJINDICES:^DJI) and the S&P 500 (SNPINDEX:^GSPC) up 1.57% and 1.49%, respectively, at 12:56 p.m. ET. Shares of JPMorgan Chase & Co. are outperforming sharply, up 7.59%. JPMorgan Chase & Co. CEO Jamie Dimon purchased 500,000 shares of his bank's shares on Thursday. Image source: Based on an original image by Steve Jurvetson, republished under CC BY 2.0. This column has focused on the banking sector this week, because that's where I see the most obvious opportunities at this time. On Tuesday, when I wrote that for high-quality bargains, investors should look at financials, I specifically highlighted two stocks: Bank of America Corp and JPMorgan Chase. The shares continued to fall, culminating in sharp losses yesterday, with B of A down 6.8% yesterday, while JPM fell 4.4%. Yesterday, however, an insider stepped in to buy half a million shares of JPMorgan, worth $26.5 million at yesterday's closing price, signaling that he believes shares are undervalued. That shareholder is what you might call an informed buyer: Jamie Dimon, the bank's chairman and CEO. A different, more cynical interpretation is possible: Dimon is simply trying to boost the market's confidence in the shares, without consideration for whether or not they offer good value. After all, according to data from Bloomberg, he already owned 6.2 million shares, so adding another half million is a relatively cheap way of trying to boost the price through signaling. In fact, based on today's 7.59% pop in the shares (as of 12:52 p.m. ET), Dimon's original holding just gained $24.5 million in value. On that basis, the purchase has essentially paid for itself. 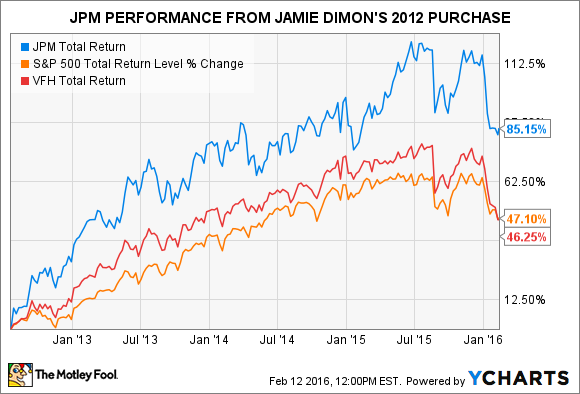 Jamie Dimon stepped up to the plate; it's a big number. 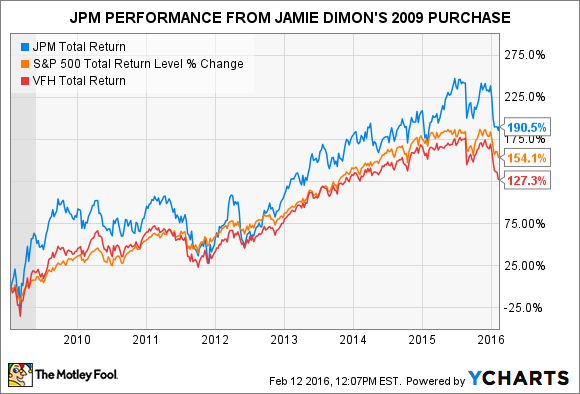 [The recent market decline is] either a financial catastrophe, or this is an epic buying opportunity, and Dimon is in position to know what outcome is more likely. Of course, you might reason that now this information is public, it's embedded in the price, resulting in today's pop, and there is no longer any way to make money in the shares. For momentum traders and other participants who confine themselves to short holding periods, that's likely to be true. For patient investors who can afford to hold the shares for at least three to five years and beyond, this Fool feels confident JPMorgan's shares continue to offer good value.